Obtaining an education has long been considered an essential component in attaining personal success. As a result, many endeavor to locate those institutions of higher learning that will fulfill this purpose. Knowledge, however, is not the only discernible characteristic needed for a productive and successful career. Integrity, discipline, and honor (among others) are also laudable and desired traits that need to be developed. Yet these social qualities are seldom emphasized in traditional academic curriculum. However, this is not so with schools that features a military tradition as a part of its overall academic offerings. These institutions offer an environment that is completely unique in comparison to traditional schools. Military schools place great stress on discipline, teamwork, and goal-oriented achievement in a blend of military structure and competitive academics. The aim: to produce highly capable graduates who are able to assume the reins of leadership in their various occupational pursuits (military or civilian). The following are the top 10 military schools. Author’s note: For this list, I’ve confined myself to American, post-secondary institutions (i.e. colleges and universities). Further, virtually every military-oriented school has features that can be found in every other institution of the same nature – such as a rigid honor code or high academic standards. As such, one may ask what the big difference from one school to another is. Well, that answer is ultimately up to the reader, but I have attempted to articulate something unique about each school, as well as the common characteristics that these institutions share. Officially designated as the Military College of Pennsylvania, Valley Forge is an interesting institution in that it is both a secondary and post-secondary school. Founded in 1928, the school is located in Wayne, Pennsylvania and offers instruction for young men in grades 7-12 (junior high and high school) as well as a two-year post-secondary offering. In fact, Valley Forge is one of only five military junior colleges and offers a direct commission into the army after only two years of study (through the army’s Early Commissioning Program). In essence, students at Valley Forge can begin their military indoctrination at a very early age and carry it through college. The school offers a very intimate atmosphere due to the small number of students (compared with larger institutions) on campus. In total, Valley Forge has about 600 students, with a little over half of these being enrolled in the college. Like most military schools, students are a part of a corps of cadets and abide by a strict, no-nonsense honor code. It’s interesting to note that the corps of cadets is described as almost completely autonomous. By this, it is meant that the student leaders within the corps are responsible for the day-to-day administration, discipline, training, etc. of the other students. Cadets are required to live on campus and follow a very structured daily routine: formation, breakfast, cleaning details, academic classes until lunch and then more classes until mid-afternoon. After classes, students participate in athletics and such, winding down to mandatory study halls from 7:30-9:30 PM. While this is fairly standard for any military school, Valley Forge has some unique characteristics that are wholly their own. One is that unlike other military schools, Valley Forge follows very distinctive British traditions. In fact, they are the only school in the U.S. that maintains British Drill and military ceremonies. Almost the school’s entire faculty is either active duty or retired military personnel from both the United States military and the British military. Valley Forge is also one of the few military schools in the nation that maintains a mounted battalion and that caters to all five branches of the U.S. military and all five service academies. Valley Forge is a bastion of traditions that are both standard and unique, offering a level of education that is not only competitive, but personal and intimate because of its small size. Their motto is “Deeds not words,” and there is no other service that better exemplifies this creed than the Merchant Marine Service. While very few consider the importance of sea transport, suffice to say that the military does. In fact, because the U.S. Navy does not maintain the necessary sealift capacity to move high numbers of military formations (personnel, equipment, supplies) to diverse locations around the world, the Merchant Marines (which are basically privately owned, U.S. flagged transports) provides this ability for the armed forces. Of course, the Merchant Marines also provide the lifeline of international commerce as the means for moving goods across the world’s waterways. To further this endeavor, it became apparent that an institution of higher education was needed to develop seafaring officers. The U.S. Merchant Marine Academy (USMMA) was established in 1942 for this very purpose end is one of the 5 federal service academies that train its students for military (or in the case of the Merchant Marine and Coast Guard, military related) service. Located at Kings Point, New York, USMMA enrolls a little over 900 undergraduate students. Getting in, however, is not easy. In fact, an excellent high school student might find it easier being accepted by Harvard or Yale. Aspiring candidates for USMMA must have strong SAT/ACT scores, write an essay, provide 3 letters of recommendations, pass a medical and physical fitness examination, and obtain a nomination from a member of Congress (either a U.S. Senator or Representative). If successful, and after a period of indoctrination the summer before the first school year at USMMA, students are welcomed into the Regiment of Midshipmen. As with all federal service academies (and one of the attractive features of attending), all expenses are paid by the government, and each student receives a monthly stipend. Life, ­however, in the regiment is about what one would expect for a military academy. When Midshipmen take their oath of office in their first year, they become members of the U.S. Navy reserve. In other words, welcome to the military! A regimented military environment is the norm at USMMA, but unlike the other academies (with exception to the Coast Guard Academy); the emphasis here is maritime in nature. Midshipmen focus their academic studies in one of two maritime-related areas: marine transportation and marine engineering. Courses of study lead to a Bachelor of Science degree in 6 different majors, as well as maritime accreditation and licensing. Additionally, USMMA midshipmen are provided a heavy course of practical experience. Between their sophomore and junior years, midshipmen are required to serve as cadets on operational U.S. merchant ships. During this time, students will visit, on average, 18 foreign countries and spend almost a year away from the academy. With four years of intense academic study, leadership development, physical and military training, midshipmen have a number of options available to them upon graduation. Unlike the other service academies that require several years of active duty service upon graduation, USMMA graduates are responsible to fulfill their government obligations on their own accord. Essentially, USMMA graduates have the option of either obtaining employment in an approved civilian maritime occupation, or serve as an officer in one of the 4 branches of the U.S. military. Graduates leave the academy with a B.S. degree, a commission in the U.S. Naval Reserve (unless they choose to accept an active duty commission), and an unlimited license as a merchant marine officer (3rd mate or 3rd asst. engineer). In short, if one is looking for a career on the seven seas, as well as a superior quality education, the U.S. Merchant Marine Academy is a very attractive option. It seems proper to follow our 9th spot with another maritime-related school that probably has escaped the attention of most of the American public. With the motto, “the sea yields knowledge”, the Military Academy of the United States Coast Guard is charged with providing officers for the U.S. Coast Guard service (or other military services). Located in New London, Connecticut, the U.S. Coast Guard Academy (USCGA) is the smallest of the five federal service academies. As with all the federal service academies, admissions are very selective. Unlike the other service academies, however, USCGA admissions standards are based solely on merit. As such, potential candidates do not have to obtain a nomination from a U.S. member of Congress. Nevertheless, USCGA is renowned for being one of the most selective schools to gain entrance to, with the school accepting about 16% of the students that apply (about 400 of 2,500 applicants). USCGA also has the highest number of women amongst the service academies, with female cadets comprising about 30% of the student body. All students, male and female, make up the schools Corps of Cadets. As with all federal service academies, USCGA cadets are on active duty (Naval Reserve), wear uniforms at all times and follow a very strict and regimented daily routine. The Corps of Cadets is a self-administrating body, which is to say that the student themselves are responsible for the day-to-day operations of other students (training, discipline, etc.). With this, the classes of cadets (freshman/4th class, sophomore/3rd class, etc.) are structured to facilitate this dynamic. The 1st class, for example, is made up of students that hold the senior leadership roles in the Corps, while the 4th class is basically a bunch of followers. The organization of the Corps, down to its smallest operation component (departments and divisions), is designed to mirror the organizational structure of a Coast Guard cutter. The idea is to provide leadership experience to cadets in a meaningful and practical way. In addition to the daily military influence cadets are required to participate in various types of intense military training during the summer (generally maritime related). In addition, the USCGA requires its students to carry a very strong academic course load, with emphasis on engineering and the sciences. Upon graduation, cadets are commissioned as ensigns and required to serve at least 5 years in the U.S. Coast Guard (or apply for commission in another one of the branches of the armed services for a similar length of time). The Coast Guard is a unique service as it is not strictly military in nature. The CG provides both emergency first response services and as well as maritime law enforcement (and come under the jurisdiction of the Department of Homeland Security and not the Department of Defense). Nevertheless, the Coast Guard has a military component in its mandate that includes harbor and port security, and the protection of naval assets. As a result, the service not only provides various challenging career opportunities, but requires an institution of higher learning such as the USCGA to train and develop the officers that allow the service to excel at its mission. Alumni: Sandra L. Stosz, admiral, first woman to command a service academy, first female graduate to earn flag rank. Officially titled “The Military College of South Carolina”, the Citadel is a school of high academic standards and rich traditions. Located in Charleston, South Carolina, the Citadel was established in 1842. The school is known for its Corps of Cadets undergraduate military program that integrates high level academics with physical training and military discipline. The Citadel is somewhat unique in the makeup of its student body. Of the 3,300 students that attend the school, 1100 of these students are civilians who take part in the schools post-graduate offerings. Another 100 or so are active duty personnel and veterans. Both of these groups attend evening classes and are separated from the main body of students. The main body of students at the Citadel (about 2,100 strong) comprises the Corps of Cadets. The Citadel has the distinction of maintaining one the largest Corps of Cadets outside of the service academies. Interestingly, the Citadel also is ranked among the top two schools in the number of officers that are commissioned among schools that offer ROTC programs. Life for the Corps of Cadets is pretty similar to cadet life elsewhere. Typically, cadets have physical training twice a day, along with drills, leadership training and, of course, their normal academic classes. Cadets are expected to stand regular formations and they march to all meals. Cadets are required to live on campus and are only permitted to go out on weekends (though they must return to the campus at specified times). In addition, a cadet cannot be married. Unlike the service academies, however, cadets, while required to participate in four years of ROTC training, are not required to enter the military upon graduation, though they are offered commissions in the armed forces (and about 40% accept). And a cadet has a good chance of graduating as well, as the school maintains a high graduation on-time percentage in the nation (69% for 4 years). The Citadel prides itself on the strong academic foundation of its graduates. In fact, Citadel engineering graduates are highly sought after and the Citadel’s engineering school is consistently ranked among the best in America. The Citadel has also produced 269 flag/general officers. Without doubt, this school produces graduates who are capable of excelling in their chosen field of endeavor, whether it’s civilian or military. Interesting note: the firing on Fort Sumter, generally considered the first shot that sparked the Civil War was not actually the first shot fired. In fact, the first shot fired was by cadets of the Citadel who were manning the cannons and fired on the resupply steamer “Star of the West'” that was heading to Fort Sumter. This they do very well. Cadets at VMI don’t even have beds! Instead, they have what amounts to a roll-out mats that are slept on. Of course there is the strict honor code, one for which a violation can merit immediate expulsion from the institution. VMI was also the last military college to admit women, doing so in 1997 under the looming threat of a court order. Tradition is very important at VMI. Nevertheless, the schools academics are without peer. Its engineering programs are highly ranked, as well as the school itself. VMI has produced more Rhodes Scholars than all of the other senior military colleges combined. Its strong academics, combined with its rigorous military traditions, succeed in producing highly motivated and capable graduates. VMI states that within 4 months of a cadet graduating, 97% are either serving in the military, employed in civilian occupations or admitted to a graduate or professional school/program. While students at VMI are indoctrinated into a military lifestyle, graduates are not required to join the military, though obviously, very high percentages do accept commissions in the various branches of the armed forces. To this fact, VMI has so far produced 265 general/flag officers and 7 Medal of Honor recipients. VMI is the only school, including the service academies, to have graduates who have served as the service chief of three of the four primary armed service branches. Success is a way of life for graduates of the Virginia Military Institute. Norwich University has been around for a while. 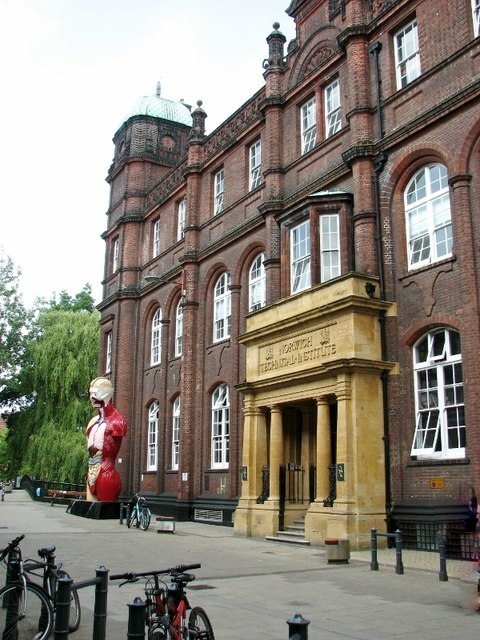 Established in 1819, Norwich has the distinction of being the oldest of the six senior military colleges. In fact, the U.S. Department of Defense recognizes Norwich as being the birthplace of the Reserve Officer Training Corps (ROTC) program. The founding of the university is interesting in that its founder, Captain Alden B. Partridge’s, intention was to create an education model that was wholly American and structured around a liberal arts academic curriculum. Captain Partridge’s motivation for doing this was to counter what he felt was an elitist (he called it burgeoning professional officers) class in America, and wanted a well-educated and trained militia to be able to counter it. He certainly succeeded in creating an institution that catered to academic excellence and military leadership development, a template that other institutions such as the Citadel and VMI would emulate. Presently, Norwich enrolls about 3,400. Officially known as the Military College of Vermont, the university has a mix of both civilian and cadet students (though the majority of the student body comprises the schools corps of cadets). The school’s motto, “I will try”, emphasizes its determination to provide a high academic standard within a traditional military styled environment. The school hosts 29 majors that span 6 academic divisions (with the most popular major being criminal justice). However, it is the corps of cadets and military styled training that stands as a hallmark at Norwich. There’s a reason the school has produced 138 generals for the armed forces. There is a continuing effort to provide the highest quality military training and development possible. In these efforts, Norwich sponsors specialized ROTC units. These include the Norwich Rangers (Army) and the Mountain/Cold Weather Company (Army and Air Force), and Air Force Special Operations Unit (the Navy component sponsors a chapter of Semper Fidelis). An interesting note about Norwich is that a high number of its graduates that are commissioned into the U.S. Army choose to become armor officers. Because Norwich is a private school, students who are a part of the corps of cadets are not required to join the military upon graduation, though obviously, high percentages do so. That’s a tall order, and one which the academy performs well to the benefit of its 4,417 students. USAFA is consistently ranked by such publications as Forbes and the U.S. News and World Report as one of the best colleges in the nation. Indeed, the academy’s undergraduate engineering program was recently ranked as the 5th best in America. With excellence comes prestige, and USAFA is one of the most selective institutions of higher learning to gain admissions to. As with all federal service academies (excepting the Coast Guard Academy), a nomination from a member of congress is necessary, in addition to other stringent criteria. Once admitted, however, all expenses (tuition, books, etc.) are paid by the government. Of course, upon graduation, one is required to serve up to five years on active duty in the Air Force, or another selected branch of the armed services. The education value is more than worth it. The academy’s curriculum emphasizes military training, academics, athletics and character development. Academically, while humanities and military studies are a significant part of the core curriculum, there is a heavy dose of engineering, science and mathematics that must be mastered. In addition, there are numerous research opportunities at the academy as well. Of course, the primary mission of the academy is to train students or cadets to become commissioned officers in the U.S. Air Force. As such, being a member of the Cadet Wing (similar to the Corps of Cadets, just a different name) takes center stage at the academy. As with other military schools, the Cadet Wing is responsible for a great deal of its own internal administration, with leadership responsibilities primarily carried out by upper class cadets. There is the traditional honor code- “we will not lie, steal or cheat, nor tolerate among us anyone who does”- that is adhered to. On a daily basis, life for the typical cadets follows rigid pattern- formations, academics, physical training/athletics, and military training. The academy’s sports programs have benefited from the level of athletic participation required. Competing at the NCAA division 1 1evel, the academy’s football team has been competitive nationally, as well as several other varsity level sports. The combination of all of this produces men and women (who make up about 21% of the class) who go on to excel as officers in the U.S. armed forces. It is surprising at the number of people who do not realize that Texas A & M is one of the six senior military colleges in America. In fact, until 1965, participation in the corps of cadets was mandatory for every student enrolled at the university. Established in 1871 and located at College Station, Texas, the schools original mandate was to “educate white males in farming and military techniques.” Presently, students have the option of enrollment into the corps or opting for a traditional academic curriculum. The university is only one of three public schools with a full-time corps of cadets on campus. Nevertheless, the university’s corps of cadets is the largest in the country (with exception of the service academies), numbering about 2,250 cadets. Considering, however, that current enrollment at the school tops 50,000, then it’s not inconceivable how the corps could be overlooked. Still, the sheer size of the university (it’s the 6th largest university in the U.S.) and the academic opportunities that come with this is certainly to the benefit of the cadets. The school has a rich tradition of providing quality officers to the U.S. armed forces. The school has produced over 225 flag and general officers, and members of the schools corps of cadets have been involved in every American armed conflict since 1875. The school’s marching band is also the largest precision military marching band- in the world! Texas does everything big. The corps of cadets, to give one an idea of the scope of its military program is broken down as follows: 3 Air Force wings, 3 Army brigades, 2 Navy and Marine regiments, nd the Fightin’ Texas Aggie Band. As a result, the university produces more commissioned officers for the U.S. armed forces than any other school outside of the service academies. And then there are the academics. The university offers degrees in over 150 different fields of study, has 10 colleges and 18 research facilities (in 2001, the university cloned the first domestic animal, a cat named CC). Opportunity is the operative word that comes to mind with Texas A & M. The school offers an environment in which a cadet/student has all the tools necessary to become a successful member of society and their chosen profession- military or civilian. There is little question about the value of a West Point education. Established in 1802 and located at West Point, New York, the academy has been in the forefront of producing leaders for this nation from the very earliest days of its inception. The motto of the school is simple: “Duty, Honor, Country”. Simple and yet very profound. For over 200 years, this school has dedicated itself to produce the highest quality of officers for service to the armed forces of America. As a result of its high academic standards and offerings, as well as its military influenced leadership and character development, West Point is consistently ranked among the best schools to attend in the nation. Gaining admission, however, is not an easy endeavor. As with all the federal service academies -selection is a tough process, with only a small percentage of applicants gaining admission each year (a little over 12%). The school offers 45 academic majors, with the most popular ranging from foreign languages to mechanical engineering. The academics at the school are structured according to the Thayer system (named after former academy superintendent Sylvanus Thayer). This system places an emphasis on small classes that allow more one-on-one interaction with students, and daily homework. The idea (with the homework) is to encourage cadets to be actively responsible for their own learning by making them accountable by completing their class assignments outside of the classroom (and discussing the assignments during the next class period). With its primary goal of training officers, as with the entire federal service academy, there is an emphasis on the military aspects of the school. All students are members of the corps of cadets and are technically on active duty in the armed forces while attending the school. Upon graduation, every cadet (now a commissioned officer) is required to serve several years in the armed forces of the United States. Currently, there are 4,487 cadets at the school (of which, about 15% are women). Cadets will reside on campus for all four years, though with each succeeding year, cadets are granted additional privileges (such as weekend passes). All 4000+ students eat breakfast and lunch together during the weekdays in the school’s enormous mess hall. This is just one of the many traditions that have made West Point a fixture in the lexicon of military schools. West Point was also the first school to have class rings for its graduates. And consider the alumni who have graduated from the school -the names read like a who’s who of military (and civilian) excellence. West Point is not just about commissioning officers for the military, it produces leaders. Alumni: Douglas MacArthur, 5 star general; George Patton, 4 star general; Dwight D. Eisenhower, President of the United States, 5 star general; Ulysses S. Grant, President of the United States, general. There is no finer institution than the U.S. Naval Academy in Annapolis, Maryland. 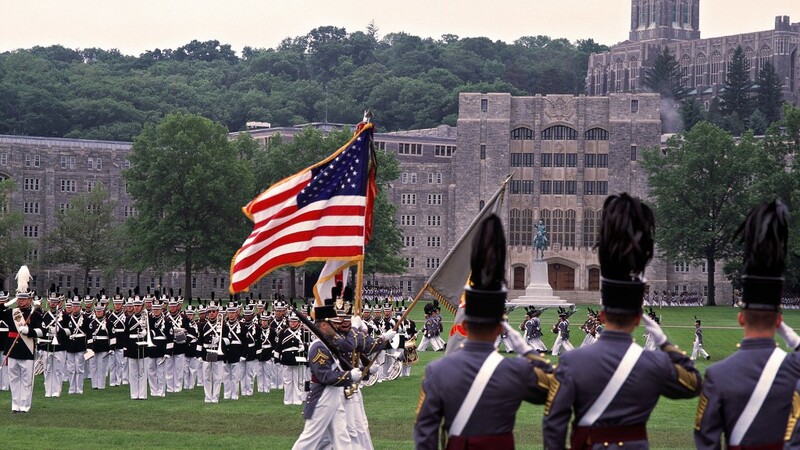 Established in 1845, it is the second oldest federal service academy, behind West Point. With an enrollment of 4,400 midshipmen, the mission of the academy is to educate, train and develop officers for commissioning in the U.S. Navy and Marine Corps. The academy produces high quality graduates that are prepared to undertake the reins of leadership in either the military or civilian sectors. The academy was recently ranked as the #1 public liberal arts college in America by U.S. News and World Report, and its engineering program is consistently ranked in the upper echelons. The academy is also an accredited Technological Institution. With 22 majors in 3 divisions (engineering and weapons, mathematics and science, humanities and social science), the academy is well equipped to provide the highest level of academic training to its Brigade of Midshipmen. Consider the pedigree of its alumni stats: 990 noteworthy scholars, 45 Rhodes Scholars, 16 Marshall Scholars, 50 astronauts (sorry Air Force, that’s more than any other school), 2 Nobel Prize winners and a U.S. President. Of course, any image of Annapolis brings with it the Brigade of Midshipmen, probably marching around sporting their crisp white uniforms. Certainly, the rigid military styled environment – as with all the service academies- forms the structure that midshipmen must acclimate themselves too. One aspect of this system that differs from other institutions is the Naval Academy’s approach to the honor code. While other institutions have a formal proceeding to address honor code violations (as does the Naval Academy), the academy encourages midshipmen to confront violators on a personal basis when the situation warrants. In this manner, it is believed that this process develops honor among the men and women, as well as a sense of moral self-worth. It is also noteworthy that the term midshipmen is not arbitrary, but is an actual naval rank (it falls between the warrant officer rank of w-1 and w-2). This is in accords with being officers of the line, but in training. In addition to a heavy academic load, military leadership training, and athletic participation, students also spend their summers engaged in specialized military training – from oversea cruises aboard U.S. warships to special schools like the Army’s Jump (parachute) school. The Naval Academy also fields NCAA division I athletic teams. However, it is their rivalry with West Point that highlights any sporting matchup (they compete against one another in every sport both institutions dually field). What is certain is that the naval officer is traditionally seen as not only a leader of men, but as an individual that is competent in their chosen endeavor. For those who attend the U.S. Naval Academy, this is what one can expect of themselves. This list is bs. It says Texas A&M’s ” corps of cadets is the largest in the country (with exception of the service academies), numbering about 1,887 cadets” but clearly states The Citadel has over 2,000 cadets. If the facts can’t line up then this list holds no weight. There is also a copious amount of wrong information presented here. The problem, as i’ve discovered since writing this list is that a lot of the information that i depended on is derived from the institution themselves. Unfortunately, it has become apparent that some institutions are not beyond using terms that are not wholly accurate. That said, I should have double checked some of these facts from secondary sources, so that’s a error on my part. So if you see something that is in error, just point it out. Thanks for reading. “Both of these groups attend evening classes and are separated from the main body of students.” – Only civilians are separated from cadets. Veterans and current enlisted personnel attend classes with the Corps. “The Citadel has the distinction of maintaining the largest Corps of Cadets outside of the service academies.” – Both el Cid and Texas A&M cannot hold this title, has to be one or the other. “Cadets are expected to stand regular formations and they march to all meals.” – Upperclass do not march to dinner. “Cadets are required to live on campus and are only permitted to go out on weekends (though they must return to the campus at specified times). In addition, a cadet be married.” – We are allowed to leave during the week. Seniors have leave on Tuesday and Dean’s List/Gold Stars can leave on Wednesday. Cadets are NOT allowed to be married. “Unlike the service academies, however, cadets, while required to participate in seven years of ROTC training, are not required to enter the military upon graduation, though they are offered commissions in the armed forces (and about 40% accept)” – We go through 4 years of ROTC classes. You have to go through a selection process to even be considered for a commission and even then few get one. Most cadets have received a 4 year scholarship before they show up here. Only about 30% go on to the military after graduation. Also Valley Forge admitted women into the college around 2007. Cadets do not mostly run the Corps there. I barely had any say so when I was a Battalion Commander there. It is predominately run by the Tacs. They want the Corps to run the Corps but it is just never going to happen with the current mess there. There was only around 598 cadets back in 2010 and over 300 of those were in the college. Now there are barley 400. VF is also not the only junior college to offer ECP. However it still is a great school and I’m proud to be an alumnus. And, I should point, some info has just changed over time. I assume you like to throw your babies out with the bath water, yes? “Life for the Corps of Cadets is pretty similar to cadet life elsewhere. Typically, cadets have physical training twice a day, along with drills, leadership training and, of course, their normal academic classes. Cadets are expected to stand regular formations and they march to all meals. Cadets are required to live on campus and are only permitted to go out on weekends (though they must return to the campus at specified times). In addition, a cadet be married. We only go through 4 years of ROTC classes. Upperclass only march to breakfast and dinner. Cadets cannot be married. You have to go through a tough selection process to even be considered eligible for a commission. Only about 30% go into the military after graduation. Valley Forge is not the only military junior college to offer ECP. They have allowed women into the college since around 2007. The cadets do NOT run the Corps. It is mostly Tac run. I barely had any say when I was Battalion Commander. The size of the Corps has not been 600 since 2010-2011. There are barely 400 now. And Texas A&M has a little over 2250 not over 2300. I just checked. Brig. General Ramirez stated to me “The Corps at Texas A&M is now comprised of almost 2,300 cadets.” Which i quoted as “over 2300”. To be absolutely accurate, he said ‘almost’ which would account for the exact number of 2250. But who’s being picky, right? The “in addition, a cadet be married” is a typo as the word ‘cannot’ should have been included. The rest of the information that i listed – again – came from the institution in question. I didn’t just make the stuff up off the top of my head. Valley Forge, for example, characterizes its Corp of Cadets as an autonomous student body (whether that’s actually the case or not). Still, thanks for the time to point this stuff out. I’m just a stickler for specifics. I wouldn’t just take the administration’s word for it next time. I would like to ask where you got 7 years of ROTC from? I have to hang my head on that one – that doesn’t even make sense on the face of it and i just checked my original draft and its there too (so i can’t blame it on the editor or something – 🙂 ) Its just a typo – should be 4 years. Surprised I missed that one. its pretty obviously a mistake. Hey, I have news for you, VFMA has been admitting women to the college alot long than 2007. The first in the college was in 1975 the year before I graduated. Hate to break it to you but here is an excerpt from a news article about females and VF. Also I was in the 2009-2010 class of females that entered VF. Women at war. That’s the headline from Valley Forge Military College, where Friday, the 73-year-old institution graduated its first-ever female cadets. Among them-the first woman at Valley Forge to earn her commission as a Second Lieutenant. Stefani: the first females at VFMA were Susan I. Briggs from Havertown, PA 1975 year book and June Robins of King of Prussia, PA same year. They were truely the first females enrolled at VF. They didn’t have uniforms nor were they commissioned. The article may say the First women to graduate from VF may be true, but reread my statement. The first women to enroll at VF was in 1975. The first woman to enroll in VF ROTC program was in 1976. 3. U.S. Services Academy Preparation known as Civil Prep. Females attending VFMAC as Civil Prep began four years ago. The first female to attend as a Prep went to the Air Force Academy, 2008. The second female to attend as a Prep went to the Naval Academy 2009. The third female to attend as a Prep went to West Point 2010. Once the third female signed on, three others followed for 2010 and three are still at West Point. Well I hate to burst your bubble about woman at VFMA, but two young women were enrolled in the Jr college in the fall of 1973 and graduated around 1975. They didn’t wear uniforms or live on campus, as they were called “day students” Their pictures are shown along with their names in the Fall 1973 “The Forge”, the schools alumni magazine. Good news! My bubble did not burst. You are correct about the women at Valley Forge enrolled in the Junior College. However, there is a separate program that did not exist in 1973 or 1975. The Junior College as you know it is now what I stated as option 2: “Fast Track”, where an individual stays at Valley Forge until graduation and is commissioned. Option 3 the Prepster program is for young men and women who live and study at Valley Forge for one year and then enter the academy. The prepsters have Congressional nominations and appointments to a service academy. The fast track / Junior College students do not proceed to an academy for four years. Women did not enter West Point until 1976, with the first female graduating in 1980. Valley Forge did not accept female prepsters for the academies until 2008. I hope this is a clearer understanding. Under Norwich University it says that “the majority of the student body comprises the schools corps of cadets.” However, as a current senior civilian student at Norwich I know for a fact that this is false. True, 10 years ago, or maybe even my freshman year this was true, but as time has gone on, they keep admitting more and more students (both corps and civilian) and the school is now basically tied for the number of enrolled students within the two life styles. School year 2011/2012 finds the following number of students, approximately 2,300 cadets, civilian residents, and commuters attend Norwich University, along with about 1,200 online graduate students. Of those students, the total size of the “Corps of Cadets” now stands at just over 1,500! Norwich University, (The Military College of Vermont), still is, (and will always remain), a Military School! They tried ESSAYONS but the French speakers scoffed the silly translations for cultural reasons among others. Try to sound fancy and fail. On a personal note, I wish a more appropriate photo could have been used for Norwich University! The photo used is of the new “Wise Campus Center”, which replaced the old Mess Hall, “Harmon Hall”. A more appropriate photo would have been one of “Jackman Hall”, the main administration building on the upper parade ground! FYI…Larry Fitzgerald only graduated from the Academy (high school), not the College. And since your list is more geared towards the college aspect of Valley Forge, he probably shouldn’t be considered college alumni. A noteworthy alumni is Wes Moore (graduated from the Academy and College, actually) who is a Rhodes Scholar, Author and more. Your write up about the school was fine (the entire article was a nice read) but I just wanted to point out a minor flaw in your alumni selections. I believe VFMAC refers to their graduated students as “alumni”. No reference to College, Academy or Prep. It covers all of the categories. Interesting fact about military school graduates—they tend to be combative. You’re a brave man for stirring this pot and your interest in the heritage and tradition of military institutions is sincerely appreciated. There is certainly a lot of passion from many graduates/alumni concerning their respective schools. I can only imagine the comments i’ll receive from veterans whenever my ‘toughest military specialty schools’ is published. Semper Fi Marine Force Recon! 2.As a ’73 grad and retiree from the top institution I applaud your bias. 3.I agree that the Army Mule is an more or less equal competitor. Nuclear Power, Surface and Submarine, USNA grads have options for which others only dream. 5.Semper Fi from my Marine Son ’04 and BZ from my Navy son ’01. West Point is tougher than any school on the list. I have never seen any cadets at Navy undergo the intense training that a West Point cadet undergoes. TAMU is the only university outside of the U.S. Service Academies that holds the honor of having a U.S. President (Roosevelt) review officers on Simpson Drill Field for selection into duty. TAMU in the #3 slot on this list is just about perfect. However, West Point should be #1. My family has graduates from TAMU and VFMAC and one at West Point. Whoop! and HOOAH! Did you consider the Virginia Tech Corps of Cadets in your analysis? ESPN did some great work last night sharing all of their military tradition during the VT/FSU game in honor of Veteran’s Day weekend. (great game, btw) They said their Corps has over 1,000 cadets. Maybe they did not hit the minimum military institution enrollment for your consideration with their great academic reputation. Just checking… Great list! For years, VMI has been seen as the racist, sexist school. It. Is. Not. My family has gone their for generations, and all have served, except for one. My dad. He went, and he blew out his knee, and tore his ACL. 8 times. So, he was deemed unable to go to war. Now, he is a millionaire defense contractor with the government. While it takes people to their limits, it benefits them in the long run. You swim in a pit, full of sewage, and dead pig entrails, and gutted animals, or you did in his time at least. So, you may think I’m crazy wanting to go there, considering the fact I’m a girl. Yes, I wear makeup, and wear heels, and straighten my hair, but it doesnt change the fact that I plan on carrying my family legacy. I’ve been a spoiled brat, and I may not last a day, but it doesn’t change the fact that I’m going to try. Maybe I’m incorrect, but I think Virginia Tech (Virginia Polytechnical Institute) has a cadet corps of less than 800…and is a lot younger than most of the schools on the list (1950’s?). As for Randolph…did you ever think that the reason that schools like A&M, The Citadel, VMI, North Georgia (all SMC’s), etc. can’t commission every cadet is that they’re capped by law? Each school has a cap set by the respective services Cadet Commands (ALL ROTC programs) which cumulatively adds up to the total accession numbers given by DoD per branch. @David, Yes you would be incorrect. The Virginia Tech Corps of Cadets had over 1000 cadets this year. The university itself was a military school (all Corps) that opened in 1872. I believe 1872 is far before your stated 1950. Like Texas A&M it went optional in 1964. Their awards run from the Philippine Insurrection and Spanish-American war, WWI and WWII to Korea. Our Corps admitted women in 1973, had the first female company commander of an integrated company by 1979 and first regimental CO by 1987. Our graduates have been Generals, Business leaders, authors, put men on the moon and taught children to read. Despite being smaller in size, this year VT commissioned over 125 of its senior graduating class. It looked like Texas A&M commissioned 80 graduates. Over all I would say the Virginia Tech Corps of Cadets has a pretty good program. I have read through all the comments and I find the readers responses interesting. I applaud the passion people have for their respective universities and branch of service, and their drive for accuracy, being heard, wanting more, etc. I want to say, “Thank you” for the time and effort you put into this article. I can imagine the time it took to research the history of each Institution was demanding, ordering the schools difficult, and trying to personal bias overwhelming. I have no doubt there are many Institutions or programs that offer the traditional military atmosphere that are solid, produce very successful alumni, and have extremely rich traditions. However, it sounds as though you were tasked to identify the “Top 10 Military Schools in America,” not the top 10 ROTC programs or top 10 divisions, etc. but Schools, Institutions, etc. No doubt the challenge this offered you. So, kudos. Nicely done. I am a proud 1990 Norwich University, Military College of Vermont alumni and the virtues and lessons I gained while a member of the Corps of Cadets are incorporated into my way of life. The training I received (mentally, emotionally, physically, and spiritually) is unmatched and thus far prepared me well for many of life’s most unpredictable challenges. Virtues such as honesty, loyalty, integrity, etc. are the benchmarks for which I place great value and I own. Norwich strengthened those characteristics in me and taught me to honor and foster those qualities, and to impart and grow them in others. Moreover, I imagine the other 9 American academies you chose for your top 10 list fosters that same approach. In summary, great job and great article. Thank you for a wonderful overview of the TOP 10 most PRESTIGIOUS MILITARY ACADEMIES and INSTITUTIONS in AMERICA. As a proud Hokie and graduate of the Corps of Cadets at Virginia Tech I must say I am a little disappointed that the Virginia Tech Corps of Cadets was not listed. The Corps at Virginia Tech started in 1872 and though it did lose numbers after Vietnam, has seen a resurgence in the last 10 years. Today they have over 1000 cadets. A majority of these cadets will go on to commission into one of the 4 branches of service (I believe they commission somewhere around 74% of their senior class) Those who don’t commission go on to serve their communities as business leaders, government employees, teachers, police officers and entrepreneurs, etc. The ROTC’s at VT are consistently rated top in their branches. We have had generals, business leaders,a Nobel prize winner, and some of our graduates helped put men on the moon (Chris Craft and Homer Hickom to name two). Academically the cadets must qualify to get into Virginia Tech before they even come to the Corps and many graduate with a degree from the competitive Engineering program. The Corps always had high academic standards and the cadets (when I was there) were always slightly ahead of our across campus counterparts when it came to GPAs. I mean it says something when the United States Army chooses to highlight your organization on their ROTC information website doesn’t it? Thanks for this article though! The Virginia Tech Corps of Cadets (VTCC) commissions a higher percentage of officers than any other senior military college. It also has the highest admission standards of the senior military colleges. The University itself. along with TX A&M, are the only Public Universities with a Senior Military College ranked in the top 25 of National Public Universities by US NEWS & WORLD REPORT. Indeed, the VTCC has over 1k cadets. was founded in 1872, and has 7 medal of honor winners. @Lee Standberry – if you rank Military colleges again and want info on the Virginia Tech Corps of Cadets – please contact me- I’m the Asst. Commandant for Recruiting at Virginia Tech – I’d be happy to give you some information. can a student from albania join any of these schools?? I cannot wait till I am able to apply. I want my son to a be a military personnel, he is just 3 years now and I need him to be built up from young age in a good US military school. What & how can I go about it. I’ve got several dogs in this fight so I’d like to try to shed some additional light on the topic. First, I’m a 1956 graduate of Valley Forge’s secondary school (12th grade) and I was very pleased to see VFMAJC, a two year school, make the list of top American Academies. I think it’s well deserved. Visit the campus some time to verify it. I spent a year in a private university ROTC program before entering West Point; graduating in 1962. As a West Point Cadet I made exchange visits to both Annapolis and Texas A&M. During my senior (First Class) year I was mentored by a brilliant Major on the faculty who was a Norwich grad. I have since visited VMI and on active duty I served with some outstanding VMI graduates and a number of fine officers from other sources. My conclusion: all of the institutions of which I have personal knowledge are fine schools and capable of producing outstanding leaders of character, even, despite our sports rivalry, the Naval Academy. That said, there is one aspect of this discussion that I find troublesome and worthy of criticism. That is, the extreme hostility towards Texas A&M and its student body exhibited by some rabid University of Texas students and alumni. For 20 years I’ve lived on the outskirts of Austin, home of UT. There is a very unhealthy strain of animosity between the schools, more notably on the part of UT, where the assertion “I hate Aggies!” is commonly expressed. It’s troublesome that school spirit can take such a nasty turn – and that’s one thing that all the military academies seem able to avoid. Our rivalries are intense, but we all respect and honor one another. As a final note, The UT Army ROTC Ranger Challenge team recently won the regional Brigade Ranger Challenge competition, defeating Texas A&M, and will travel to West Point later this year to compete in an international event. Hey! thinking about going into a military college. Could you give me advice/can we talk?